We are a remarkable entity, engaged in manufacturing high quality ambit of Brass Transformer Parts. 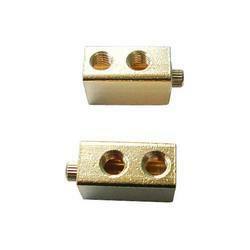 Any kind of Brass connectors terminal can be developed and supplied exactly as per customer specifications. Being one of the trusted firms in the industry, we are highly engaged in providing a unique range of Brass Terminals. 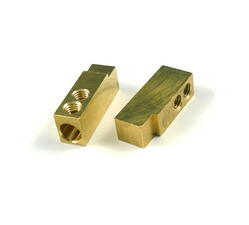 We provide a wide range of Brass Earthing Terminals in various technical specifications. Offered in various specifications and technical details, these are further stringently tested on well defined quality parameters to ensure durability and longer service life. Modular Switch & Socket Terminals. In line with client's diverse needs, we bring forth a distinguished ambit of Brass Switchgear Terminal. Being a customer oriented organization, we are deeply engaged in offering a wide array of Brass Stamping Terminal. - Approx. Rs. 25 to Rs. 400 per piece as per size, quality and market. We have especially fabricated Brass Terminals range for use in a wide variety of applications in various industrial phases. The offered terminals are well manufactured under the vigilance of our diligent workforce making use of high grade brass with the assistance of advanced methodology. Being a customer oriented organization, we are deeply engaged in offering a wide array of Brass 6A Terminal For Switches. - Approx 500 Rs to 1000 rs per kg. We are one of the most well-distinguished companies in the market that are into offering Brass Terminal. 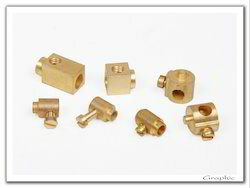 Bhavi Brass Components is a Group of Companies Engaged in Manufacturing, Exporting & Supplying of Micro Precision Brass and Various Ancillary Metal Components for Electricals, Electronics, Automobiles, Telecommunications, Medical Equipements, Bicycle, Building Materials, Switchgear, Railway, Defense Technologies & Hardware Industries. With the steady support and positive efforts of our team members, we are instrumental in providing a qualitative range of Brass Round Terminal. Excellent finish, sturdy make and long-life are some of the highlights that set apart our range of Brass Terminals. We offer the best Brass Terminals at economical rates to the clients. We are amongst the trustworthy Manufacturers, Suppliers and Exporters of Brass Terminals. Approx 400 Rs to 1000 Rs per kilogram as per quality and market.